Amazingly, these parents will continue taking things away (often things of lesser and lesser value to the child) knowing its not working, but hoping there will be one time when the kid turns to them and says, “OK. I’m sorry. I get it now. I will stop screaming at my sister.” How often does that happen? Not often (I’m being nice). Here are some ideas and notes about these strategies, what to do and what not to do. Some of this I have mentioned before, but is worth repeating in this context. Avoid this “taking away” strategy altogether…hmmm, now that was easy. Control access to these preferred items (i.e., keep the Wii controllers out of their reach) and activities and offer access to the child when they have done well rather than taking them when they have not. All you have to do is deliver…nice and easy and on a daily basis. 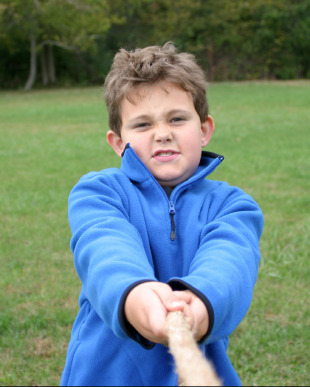 Please do not engage in a physical tug of war over something. Please. Don’t grab the controller, the video game, etc. in a fit of emotion or argument. This is especially for older children who might fight back. Do not take away something that you ultimately do not control. For example, don’t tell your child he cant go outside until he finishes his homework, unless you can make sure he cant go outside. For the older and more gutsy kids, they might try to go outside, even when you told them not to. If you can’t control it, I wouldn’t use it. I would hate to see you take the Wii away, not get the controllers, then come into the living room to find your son and daughter in a competitive game of Guitar Hero. Smoke is coming out of your ears and he just showed you up. Leave the rope where it is…you have lost every time anyway.